The New EZiCAT i550 features state‐of‐the art digital signal processing (DSP) and intelligent software, the EZiCAT i‐Series locators make ground surveys a simple and speedy task; increasing onsite safety and ultimately saving time and money. Every year site workers are injured due to inadvertently striking buried utilities such as electricity cables or gas pipelines. Local legislation normally prescribes the use of a locating device before any kind of excavation takes place. It makes perfect sense to search for, trace and mark all services before work commences. The EZiCAT i550 features a uniquie depth function which allows the user to measure the distance below the surface of the service you are tracing. Simply locate your service in conjunction with an EZiTEX Signal Generator or Sonde and press the measurement button. The depth of the service is then shown clearly on the digital display. This function allows you to determine if the pipe or cable is at a depth that will inpact on your excavation. When using a standard CAT you are required to scan the area of interest with the sensitivity set to high. Once the unit gives an indication of a service you then have to continualy dial down the sensitivity until you have located the exact location of the service. At this point you then have to turn up the sensitivity again to start tracing again. On The EZiCAT all of this is done automatically reducing errors and survey time. Buried services close to the surface pose a potential safety risk. 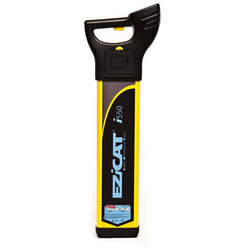 The EZiCAT i-series provides a close proximity alarm alerting the user to any immediate danger in the area being scanned. This Unique feature allows you to trace the position of a service much more accuratly. It also enables you to trace individual services that may be of interest that have been laid in amounts others. This functions also offers the simplist solution for tracing Sondes as the highest reading gives the exact location directly above the Sonde.